On this day, the statistic that women make 77 cents for every dollar a man earns is repeated all over the media and throughout government. It is often taken at face value that this statistical disparity alone is entirely the result of discrimination against women. “Why is it that I make much less than a man for the same amount of work?,” many women have openly inquired on social media and elsewhere. But the famous 77 cents statistic only looks at the median wage for women relative to the median wage for men. It ignores many other variables, such as occupation, education, experience, etc. 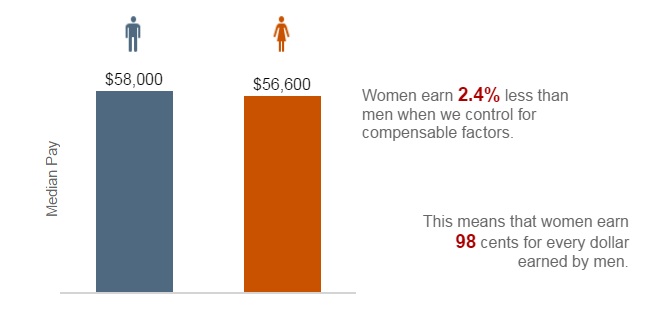 It therefor does not tell us anything about whether comparable men and women are being compensated equally. A 2009 study produced by CONSAD Research corporation used data from a sample size of over 74,000 men and over 72,000 found that the gender wage gap narrowed to 5–7 percent once comparing similar men and women. Based on over 500,000 salaries shared by US employees, a 2016 study by Glassdoor.com found that, once controlling for other factors like education and occupation, a woman earned approximately 95 cents for every dollar a man earned. PayScale.com conducted their own study, which pegged the unadjusted “wage gap” at 76% in 2016 (i.e the median woman earned 76 cents for every dollar the median man earned.) However, once they accounted for other variables, the authors concluded that women made approximately 98 cents for every dollar a man earned. A study published in the American Economic Review by economist Claudia Goldin also suggests that the “wage gap” can in part attributed to the fact that men tend to work more difficult and less flexible (but more profitable) hours than women. “…a flexible schedule often comes at a high price, particularly in the corporate, financial, and legal worlds.…The gender gap in pay would be considerably reduced and might even vanish if firms did not have an incentive to disproportionately reward individuals who worked long hours and who worked particular hours,” Goldin concludes. To summarize: The evidence suggests that the “gender wage gap” is not primarily or largely the result of discrimination against women, but rather a result of the choices that men and women generally make when it comes to their careers. When looking at similar men and women, the wage gap virtually disappears, and any small remaining differential could be driven by labor-market choices that are hard to measure. Edit: Of course, discrimination may play a role in the raw “wage gap,” albeit in a more indirect way than the 77 cents statistic would imply. Women may face social barriers to higher paying jobs, which may reduce their earnings relative to men. This is an important point, but not the focus of the article. The point of the article is to show that the claim that women earn 77% of what men earn, for the same work, is untrue. “Based on over 500,000 salaries shared by US employees, a 2016 study by Glassdoor.com found that, once controlling for other factors like education and occupation, women earned approximately 95 cents for every dollar a man earned. So what you’re saying is that women have less access to education and have poorer hiring opportunities. Guess what? The gender gap still exists. But thank you for man-splaining your perspective. No, Emily, it doesn’t. And I’ve read numerous times that more women attend college than men, at least at the undergraduate level. Something else that is relevant is that although men & women are of equal intelligence, men produce a disproportionate number/percentage of those of both above and below average IQ. This partially explains why men disproportionately occupy both the top and bottom rungs of society. Men will always produce a disproportionate number/percentage of the world’s geniuses & leaders. Women will always be overrepresented in the nurturing vocations and a certain number will always want to be homemakers, and there’s nothing wrong with that. Oh silly little girl. You didn’t comprehend much in this article, did you? I’m curious what you consider “less access”. Wrong, women are graduating at much higher rates than men. The difference is that the most popular degrees for women also are historically low paying. More women than men graduate from College today. Pls explain how women have less educational opportunities.